This morning, Pastor Gabe is preaching from 1 Corinthians 3:10-23 in a sermon entitled "Watered." There are those who plant and those who water, but it is God who provides the growth. Both the farmer and the harvester will receive the same reward. Sunday school begins at 9:30 and the worship service will be at 10:30. Pastor Gabe will be back to his regular office hours this week, Monday-Wednesday from 9am to 5pm, or by appointment. 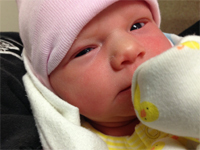 Congratulations to Pastor Gabe and his wife, Beki, on the birth of their fourth child, Mariah Lyn Hughes. She was born today at 2:40pm at Morris County Hospital. She was 6 lbs, 4oz and 21 in. long. Mama and baby are doing great, and should be home tomorrow! There will not be any elders meeting this week, and Gabe won't be hosting Bible study at his home on Thursday as the family gets settled in with their new arrival. He'll be back to regular office hours next week. 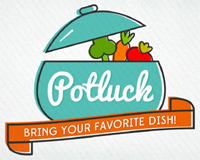 Join us after church today for our potluck downstairs in the fellowship hall! Bring something if you are able, whether that is an entree, side, or a desert. There will be plenty of food, so plan on sticking around with us for some good eating and great company! Pastor Gabe will be preaching on 1 Corinthians 3:1-9 in a sermon entitled "Planted." Sunday school will begin at 9:30 and the worship service is at 10:30. Worship will be led this morning by Alister and Zenida Joseph. Ice storm Jupiter is upon us this weekend, but we are still having church! Service is at 9:30 and worship at 10:30. Please use discretion about travel. Just know that we'll have the heat on and the sidewalks salted when you get here. Because we're uncertain as to what kind of turnout we will have, we've postponed the potluck until next week, January 22. Pastor Gabe will be preaching on 1 Corinthians 2:9-16 in a sermon entitled "Revealed." The following is a clip from a couple weeks ago in our series through 1 Corinthians. Good morning! Rise and shine! 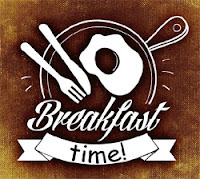 We've got breakfast at 9:00 this morning in the fellowship hall. Park around back and enter through the white double-doors. Enjoy some good food and a devotional shared by Dave Bliesner. It's all free! After breakfast, we're going to continue doing some work around the building. Some of that work might involve digging out front. If you're able to hold a paint brush or just move some things and clean some space, we could use your hands.